As you can see in the graphic, in the midst of this last section, where Jesus' authority was challenged by the Pharisees, we are interrupted by a section of historical events in Jesus' life. Recall that my early thesis, way back in January, was that Matthew arranges the teachings of Jesus more topically than chronologically. However, here in the last week of Jesus' life, the chronological account and the topical account meet together: for the final topic--the challenge of Jesus' authority--did not happen until the end of His ministry. So it is that in the middle of our sixth section of teaching, Matthew breaks out of Jesus' debates with the Pharisees to give a few historical events which happened as well. 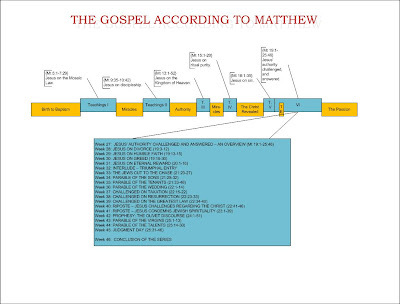 I will not go through these in detail; perhaps next year I will do a series of the "Acts of Jesus", where I go through the other half of Matthew (the half fills in the gaps which I am leaving in this series by focusing only on His words and teachings). But for now, we will consider this passage "out of scope" for my study. Thus I will simply give a very brief overview of what happens during this passage. Mt 20:17-19: Jesus begins to approach Jerusalem for the Passover feast in the final year of His life. For the third time, He prophesies to His disciples that He will be crucified. Mt 20:20-28: The mother of the sons of Zebedee asks Jesus to promise her that her sons will sit beside Him in places of honor in heaven. (You can't fault her for lacking boldness, can you?) Jesus tells them that they do not know what they are asking, and then asks if they are capable of drinking from His cup--a reference to His impending death. They say so, and Jesus (sadly, it seems to me) confirms that they will both be executed as well. But He then says that it is the Father's authority to grant where they sit. The other disciples are ticked off at the Zebedee power-grab, but Jesus tells them all to chill out. If they want to be great in His kingdom, He reminds them, they must be willing to serve others--not rule over them. Mt 20:29-34: Jesus heals two blind men. Mt 21:1-11: The Triumphal Entry - to throngs of cheering crowds, Jesus enters Jerusalem as an honored prophet. He would leave it a week later, wrapped in clothes of the dead. Mt 21:12-22: Jesus gets upset at the hypocrisy of the Passover festival and the Jewish Temple. He is frustrated to see that the Temple outwardly appears to be a place of God yet inwardly is involved in corrupt practices like money-changing and selling of sacrifices (basically, very similar to the selling of indulgences by the medieval Catholic Church which so desperately angered some priests, like Martin Luther). Jesus yells at them and overturns their tables, furious that they were turning God's forviging grace into a chance to make money. The next morning Jesus curses a fig tree because it appeared to have fruit but didn't; this is an extension of His actions at the Temple, showing that God is upset when we look good on the outside but are corrupt on the inside. All this ties in very well to Jesus' teaching: if you had to sum up all of Jesus' teachings in one statement, you might well say: "Actions do not make the heart righteous; what is in the heart makes a person's actions righteous." Next week, in verse 23, we will see the Jewish challegers finally cut to the chase, and return to Jesus' expository teachings.